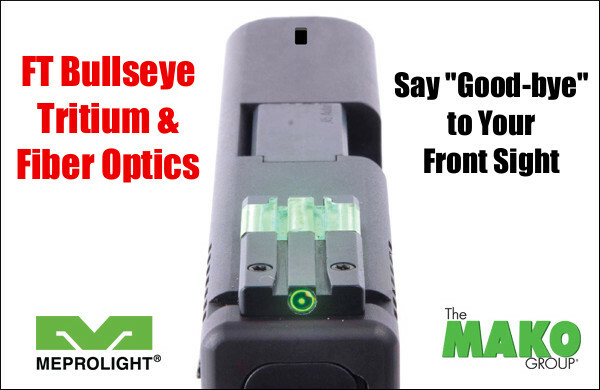 Meprolight FT Bullseye system does. Employing fiber optics and tritium, the FT Bullseye provides a bright aiming dot inside a circle — no front sight is needed. When the dot is centered in the circle, you’re on target. It’s as simple as that! The front blade is rendered superfluous. 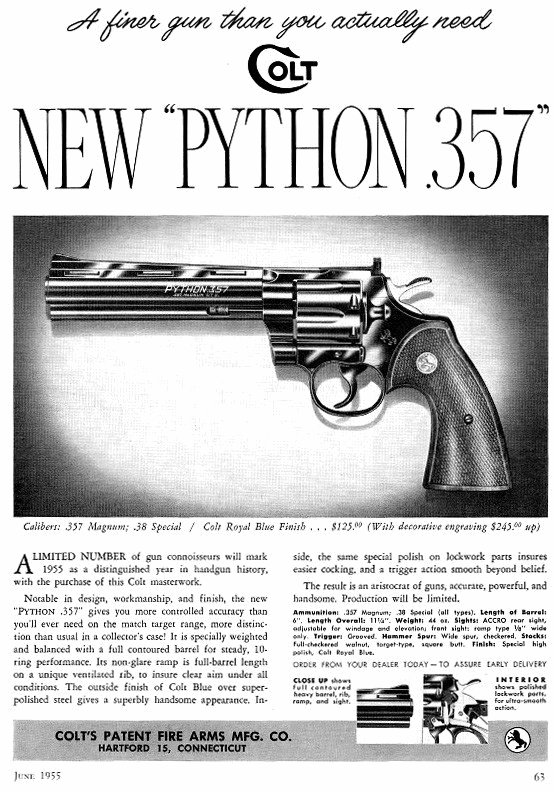 This really is innovative technology, albeit expensive — the FT Bullseye’s street price runs from $99 to $150, depending on pistol make and model — not cheap. Share the post "Radical Meprolight FT Bullseye System Dispenses with Front Sight"
It’s not Black Friday yet… but there are already some notable bargains to be had. Brownells has kicked off its Pre-Black Friday Sale today. Along with dozens of marked specials, you can get $10 Off $99+ with code NBM (plus FREE Shipping), $15 Off $150+ with code NCS (plus FREE Shipping), and $20 Off $200 with Code M8Y (plus FREE Shipping). Jump on those code deals — they may expire soon. 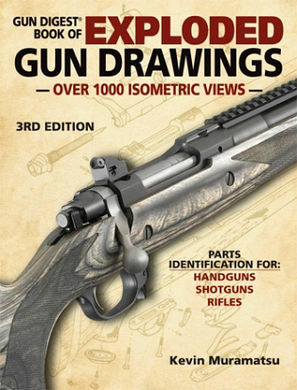 To make things even better, there are some MORE Brownells discount codes in play through 11/25/18 (Sunday) at 11:59 pm. These all use the FN prefix. Get Free Shipping with no minimum with Code FN4. Get $20 off $200 with Free S/H with code FN3. Get 10% Off $300 with Free S/H with code FN3. 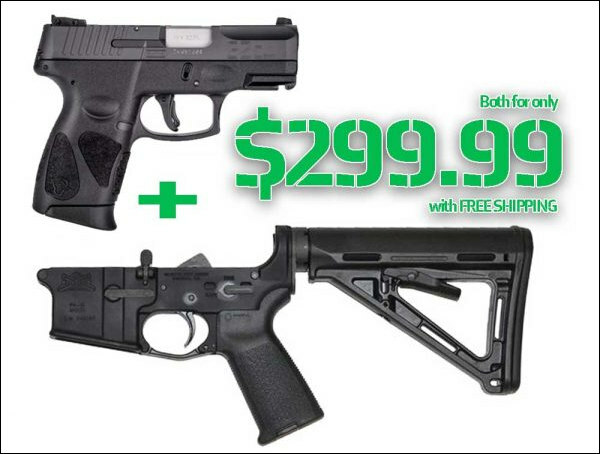 As Brownells says these are great deals. In addition, there are a variety of great deals on factory loaded ammunition, including up to $100 off on Federal “Black Pack” bulk ammo. 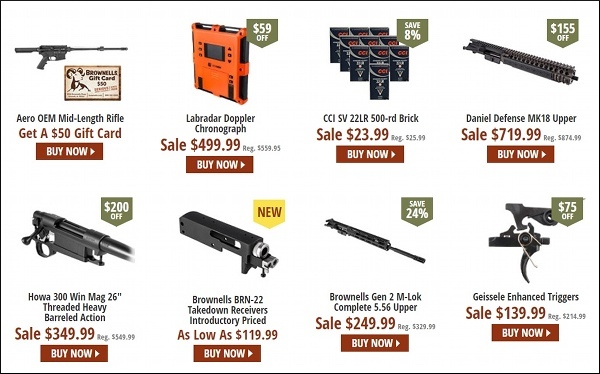 Share the post "Get a Jump on Black Friday Sales at Brownells — SAVE NOW"
Bad news for Washington State gun owners. The draconian gun-control initiative, I-1639, passed in this week’s election, with roughly 60% voter approval. Big changes are in store for the Evergreen State, starting January 1, 2019. 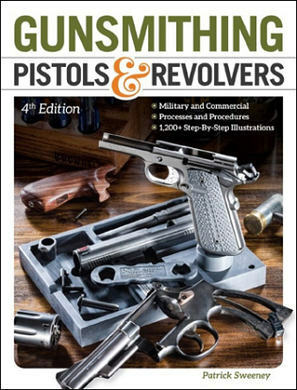 According to Guns America, “I-1639 bans the sale of semiautomatic rifles to adults under the age of 21, creates a registry of gun owners, establishes a 10-day waiting period for certain purchases, holds gun owners liable for failing to secure firearms, and allows the state to charge a $25 fee on the sale of [broadly defined] ‘assault rifles'”. The age restriction on gun purchases goes into effect January 1, 2019. The other provisions commence six months later, on July 1, 2019. 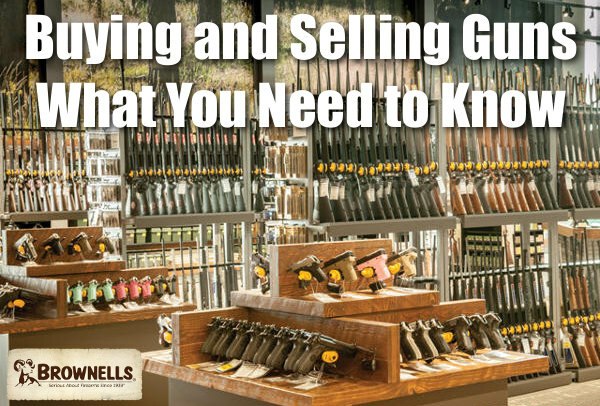 Outdoor stores and gun-shops are getting ready for the new law, expecting confusion and some panic buying. “Now we’ve got a law that’s going to cause problems for us and it’s going to cause problems for consumers and the impact on crime is going to be zero. So there’s going to be a rush for people buying guns and beat the law to the punch but I think ultimately though it will have a negative effect for a while on gun sales” said Wade Gaughran of Wade’s Eastside Guns in King County, during an interview with KOMONews. Despite the election result, there is some hope. Gun rights groups plan to challenge I-1639 in court: “The Second Amendment Foundation (SAF) and the National Rifle Association (NRA) will be jointly filing a court challenge to I-1639 and the chilling effect that it has on the constitutional right to keep and bear arms,” said SAF founder Alan Gottlieb. Alan Gottlieb explains that many negative aspects of I-1639 were not understood by voters. This initiative threatens privacy rights, and interferes with citizens’ ability to defend their homes. “Not only does the initiative discriminate against gun owners, it classifies common recreational firearms as ‘semiautomatic assault rifles’ and requires gun buyers to surrender their medical privacy in order to exercise a constitutionally-protected right.” I-1639 was pushed by the Seattle-based Alliance for Gun Responsibility, an extreme anti-gun advocacy group funded by billionaire dollars. I-1639 was in fact so badly-drafted and extreme that even law enforcement organizations opposed this far-reaching anti-gun measure. In the weeks leading up to the election, the Washington State Sheriffs Association (WSSA), Washington Council of Police & Sheriffs (WACOPS), and Washington State Law Enforcement Firearms Instructors Association (WSLEFIA) all opposed I-1639. 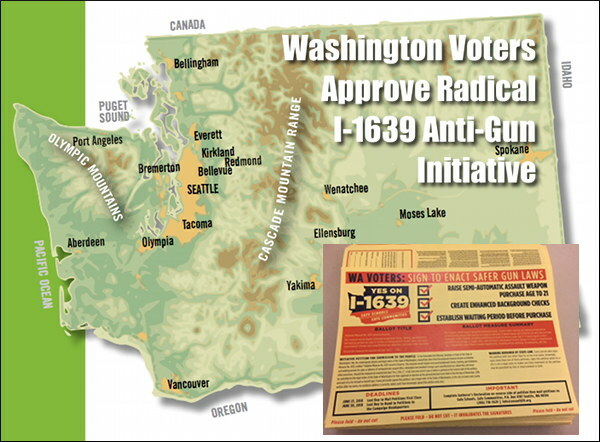 Share the post "Radical Anti-Gun Measure, I-1639, Wins in Washington State"
This is really a stunning deal. 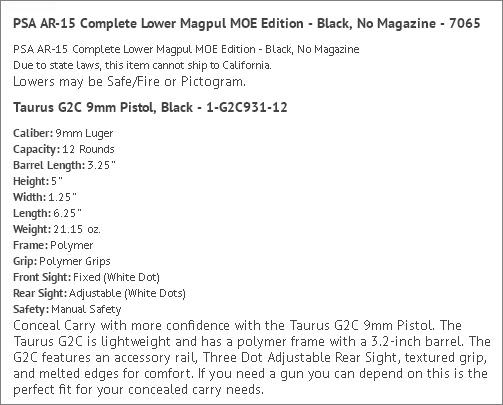 You get a complete PSA AR15 lower with MagPul MOE stock PLUS a Taurus G2C Pistol — both items for just $299.99. You even get free shipping. Note, both products will require an FFL for delivery, because the AR15 lower is considered the firearm under Federal law. 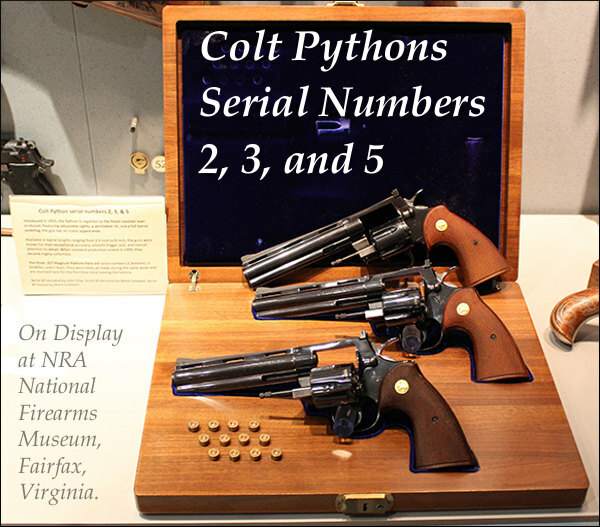 Depending on the state, additional requirements may exist for pistol purchase/transfer. This is a crazy good deal — complete AR lower AND a pistol for $200 less than you’d pay for a Glock 19 by itself. Note, this deal expires Monday, 10/29/2017 at 11:59 pm EST. Credit Ammoland.com for finding this deal. Every morning Ammoland posts a new bargain on its Daily Gun Deals page. You can also subscribe to get the Ammoland’s Daily Deals via email. 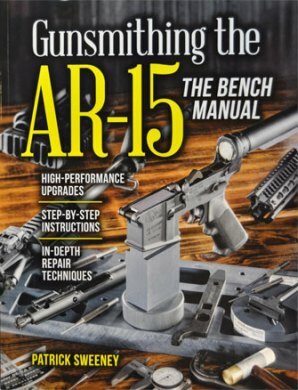 Share the post "Get 9mm Pistol AND Complete AR15 lower for Under $300!" Here’s a handy, portable gun caddy that works well for rifle maintenance chores at home or at the range. Save big right now — the Tipton Gun Butler is marked down to $14.82. That’s 45% off the regular $26.99 price. 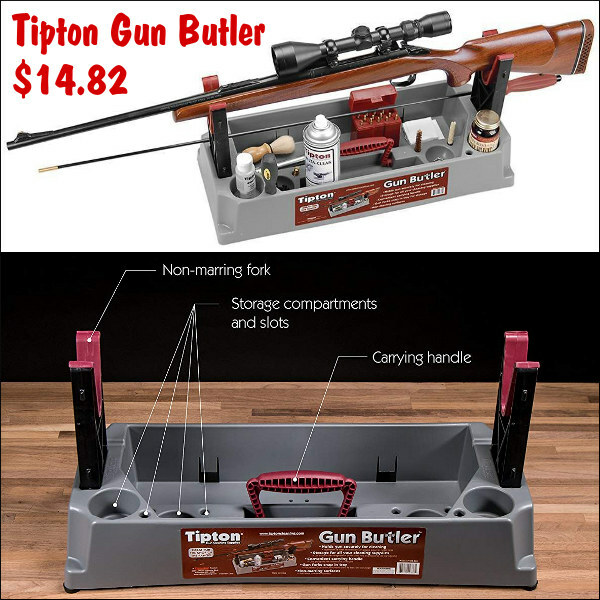 The Gun Butler offers a convenient platform for cleaning your gun or doing tasks such as scope mounting. Two removable, non-marring forks/cradles (which snap into the base) hold a gun securely in place, while compartments and slots hold solvents, jags, brushes, mops, and tools. The Gun Butler features a convenient carrying handle, and slip-resistant rubber feet. The base is solvent-resistant polymer. NOTE: The front cradle may not work well with wide benchrest fore-ends. Stock up on rimfire ammunition this week. 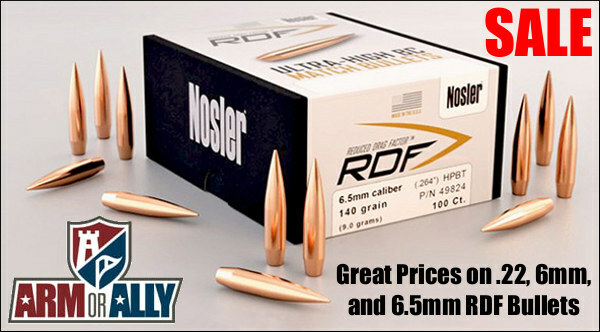 Grafs.com has slashed prices on all in-stock rimfire ammo — .17 caliber and .22 caliber. 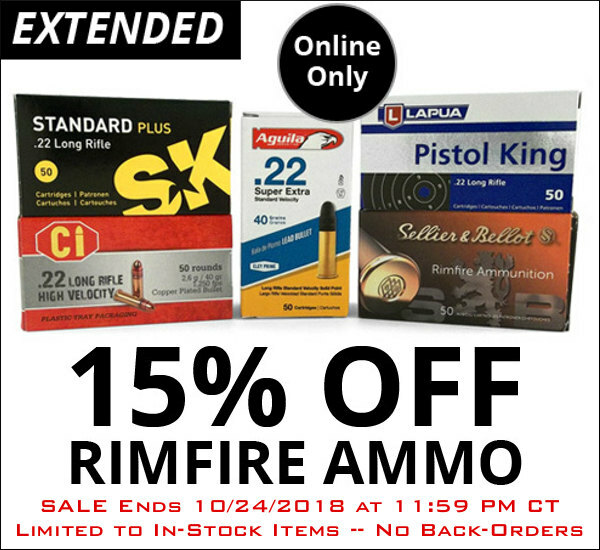 Save 15% on a huge variety of rimfire ammunition for plinking, hunting, and target applications. All brands in-stock are discounted 15%: Aguila, Browning, CCI, Eley, Federal, Fiocchi, Hornady, Lapua, Norma, Remington, SK, Winchester, Wolf, and more. 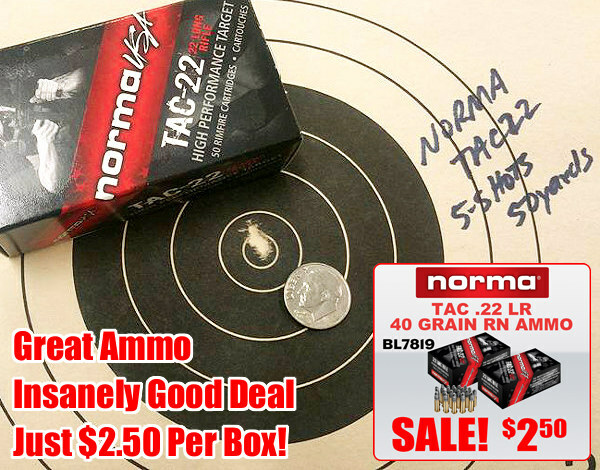 While most discounted rimfire ammo is .22 LR, this sale also includes .22 Short, .22 WMR, .17 HMR, .17 WSM, and 17 Mach2. 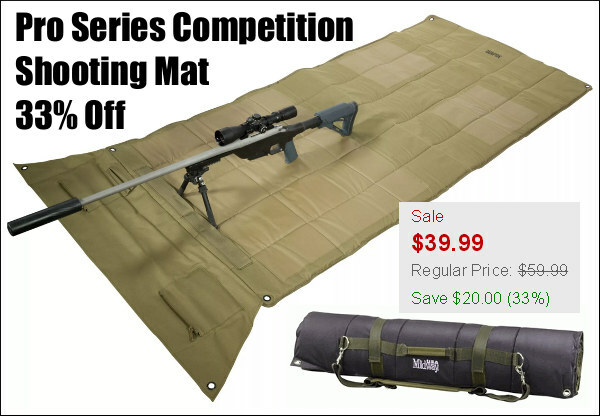 The MidwayUSA Pro Series Competition Shooting Mat is now on sale for just $39.99, 33% off the regular $59.99 price. The Pro Series mat measures a full 73.5″ x 35.5″. 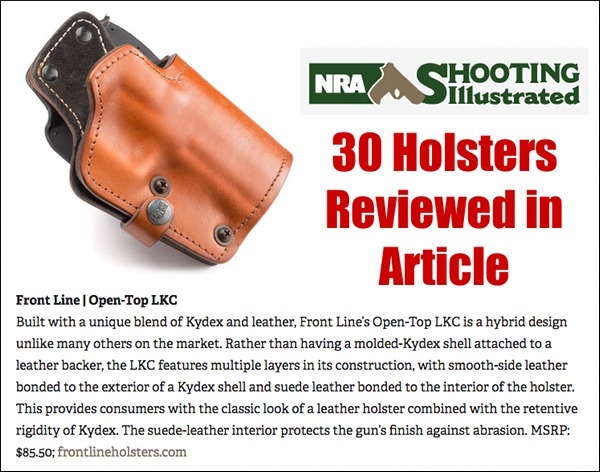 Zippered pockets on the front flap hold ammo or log books. And there are webbing “pockets” for bipod feet so you can pre-load your bipod with forward pressure. This quality mat boasts 0.35″ thick padding, multiple pockets, 6 grommets for staking, and a nice carry strap. It’s easy to transport, rolling up to about nine inches in diameter. NOTE: This mat is currently back-ordered, but MidwayUSA will honor the $39.99 sale price and inventories are expected very soon. Need a very affordable laser rangefinder (LRF) for that fall hunt? Here’s a deal that’s hard to beat. 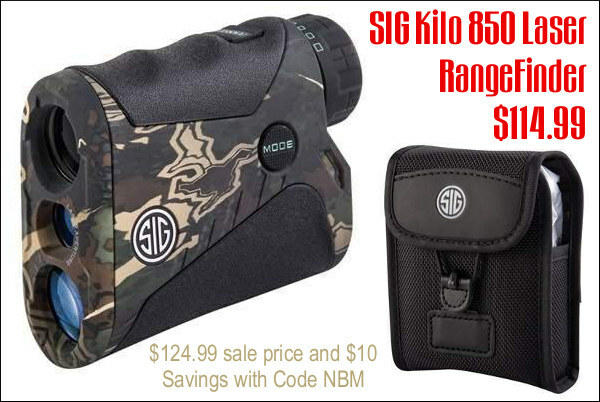 The SIG Kilo 850 Rangefinder is on sale at Brownells for $124.99 and you can get another $10 off (plus free shipping) with CODE “NBM”. That lowers your final price to $114.99 delivered. This Kilo 850 rangefinder is rated to 1200 yards on reflective objects and 800 yards on trees. The unit has a 4x20mm monocular and delivers both line of sight (LOS) or angle modified range (AMR) in yards or meters. NOTE: For CODE “NBM” to work, you must add the code on the FINAL Payment Page. The Ruger Precision Rimfire .22 LR rifle is in high demand, but you CAN get one now for $399.99 from Sportsmans Outdoor Superstore (MSRP: $529.00). 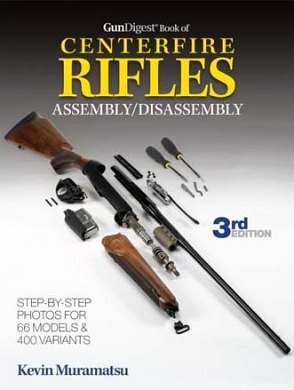 That’s a good deal — this rifle sells elsewhere for up to $470.00. For PRS shooters and Ruger Precision Rifle owners, this .22 LR rifle offers the same ergonomics as their centerfire tactical rig, making it great for rimfire cross-training. 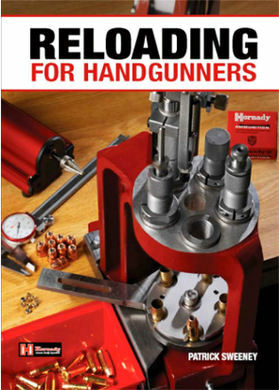 This PRS-style .22 LR rig features an adjustable bolt throw that lets shooters change from a rimfire 1.5″ bolt throw to a centerfire-like 3″ bolt throw, reducing the chance of short-stroking your bolt in competition. The Ruger Marksman trigger adjusts from 2.25 to 5.0 pounds. The Hornady Lock N Load Auto Charge Electronic Scale/Dispenser is now on sale for just $158.99 at Midsouth Shooters Supply, discounted way down from the regular $226.24 price. That’s the lowest price we’ve seen on this product, making this a real bargain. If you are looking for an affordable combination digital scale and powder dispenser, check this out. 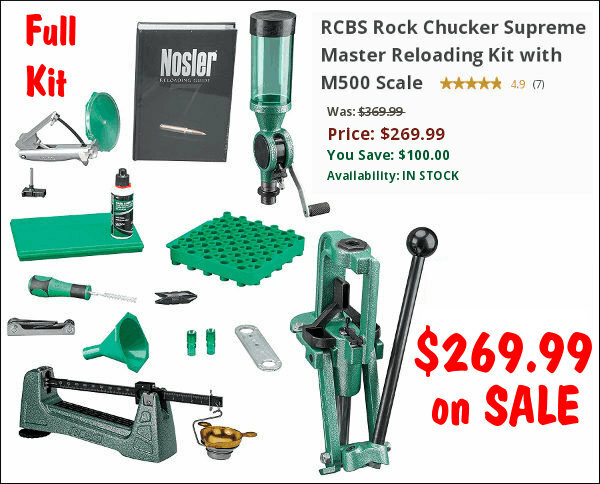 By comparison, the RCBS ChargeMaster Lite sells for around $230.00. That means you can save around $70.00 by buying RED instead of GREEN. 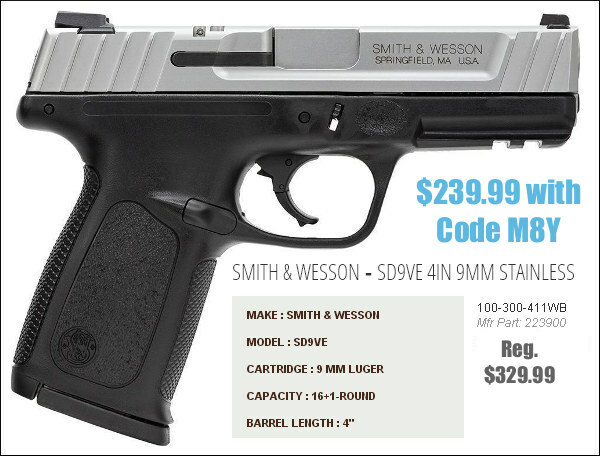 Here’s a good little 9mm carry pistol for a crazy-low price. 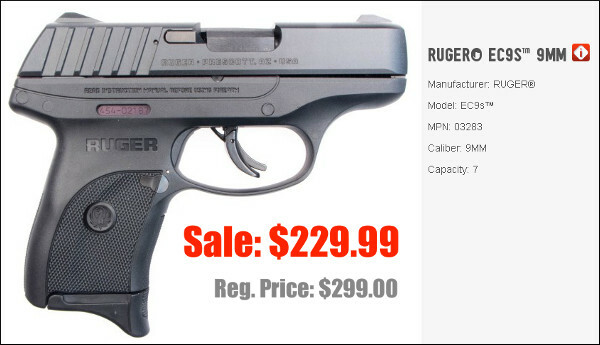 Right now, CDNN is selling the popular Ruger EC9S 9MM pistol for $229.99 — that’s $70 off the regular $299.00 price. 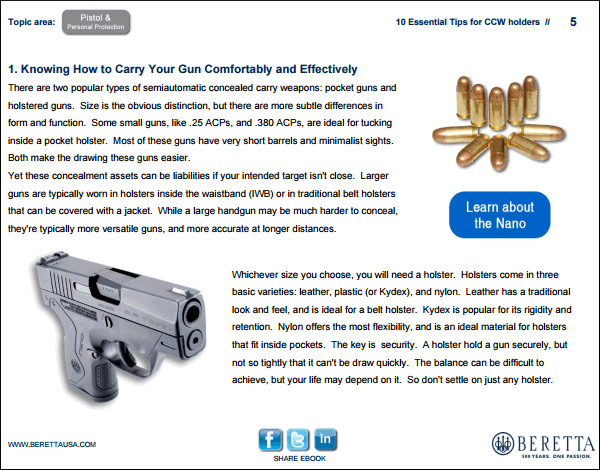 This gun is light (17.2 ounces) and thin so it’s easy to carry discretely. The EC9S is 6″ overall with a 3.12″-long barrel. The EC9S features integral sights and ships with a single 7-round magazine. 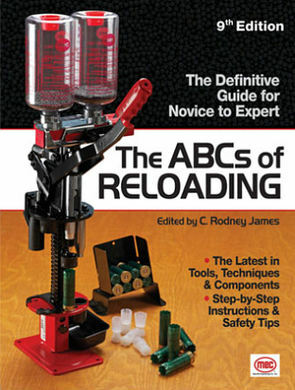 Share the post "Bargain Finder 161: AccurateShooter’s Deals of the Week"
Right now Precision Reloading is running a big sale on reloading powders. 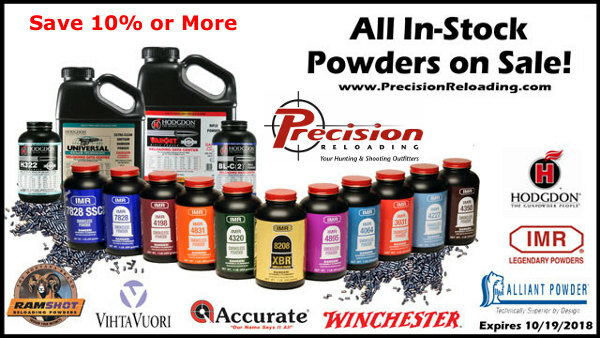 Save 10% or more on all leading powder brands: Accurate, Alliant, Hodgdon, IMR, Norma, Ramshot, Vihtavuori, and Winchester. 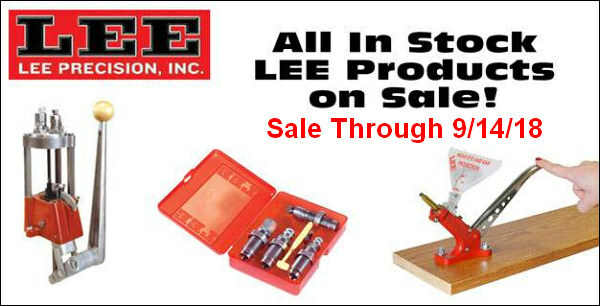 The sale applies to all one-pound containers, as well at 5-lb and 8-lb jugs. If you need powder, don’t hesitate — this promotion ends 10/19/2018 at 11:59 pm. NOTE: In addition to powders, Precision Reloading has CCI primers on sale this week — save up to 17% on all CCI primer types. Lyman’s new Ideal compact press works great as a second, lighter-duty press. It also is a good choice for loading at the range. It can easily be mounted to a range bench with C-clamps. With its cast-iron body, this C-Frame press is stronger than other presses in its price class. If you are looking for a secondary press for decapping, bullet-seating and other tasks not requiring heavy leverage, this is an excellent choice. 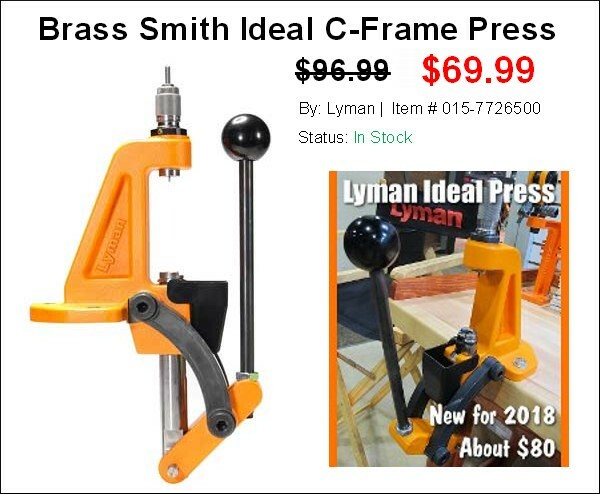 The Lyman Ideal costs just $69.99 at Midsouth Shooters Supply. Zeiss makes great scopes with superb glass, reliable tracking, and very positive clicks. Now you can save hundreds on Zeiss V4, V6, and V8 optics. The V4 is an affordable scope for hunters, while the V8 Line offers a stunning 8X zoom ratio. The V6 models, with 6X zoom ratio, are outstanding scopes that compete very well with Nightforce and other top brands on price and performance. Competition and long range shooters should definitely look at the V6 line-up. 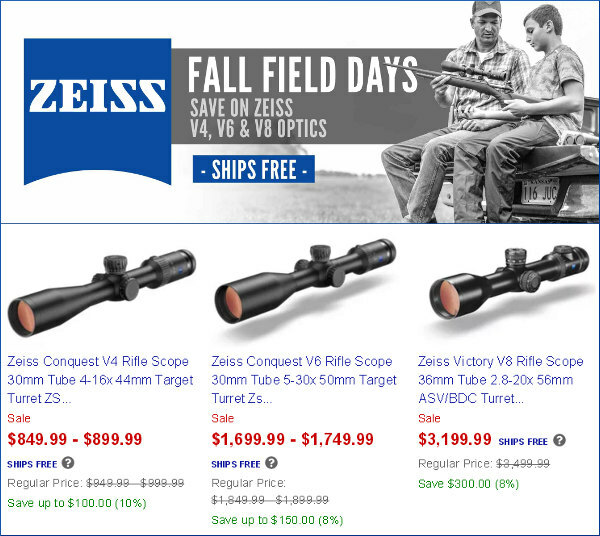 NOTE: These discounts are part of a Zeiss Field Days promotion running through 10/29/2018. See similar incentives at other retailers. 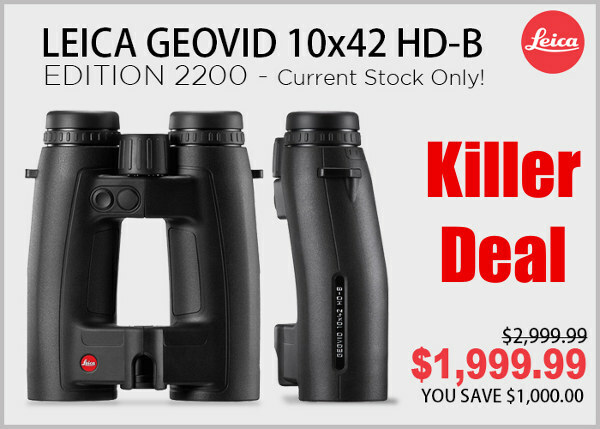 Leica’s outstanding Geovid 10×42 binoculars feature a built-in laser rangefinder rated to 2000 yards. We’ve used this HD-B 2000 unit and the optics are superb and the rangefinding is super fast. When placed on a tripod for support we were amazed at the ranging ability of these Geovids. Give credit to great glass, minimal beam divergence and Leica’s excellent error correction software. Act now and you can save $1000 over the original price. Note: This is discontinued model that has been replaced by the newer Leica HD-B 3000, priced at $2999.00. The new SIG P320 is one of the best compact 9mm carry guns on the market. Accurate, slim, and reliable, it has earned praise from owners and reviewers alike. Yes we would rather carry a P320 than a sub-compact Glock. 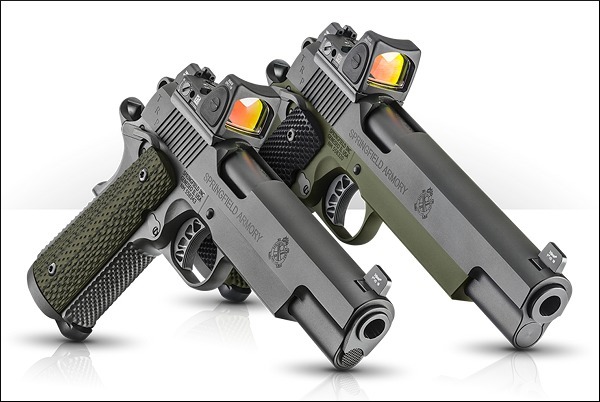 This modular, striker-fired pistol features a sub-compact grip, slim slide, and Night Sights. Safety features include a striker safety and disconnect safety. 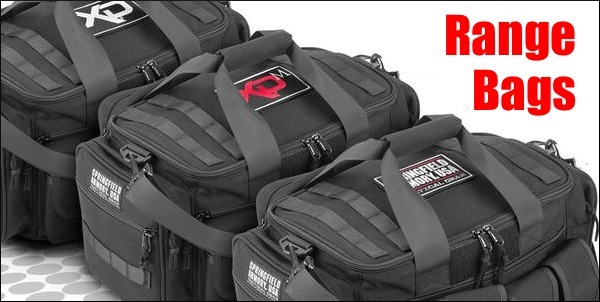 Brownells’ sale price is $399.99, marked down from $579.99. NOTE: Some buyers report you can get an extra $20 OFF with code “M8Y” entered on the final payment screen. 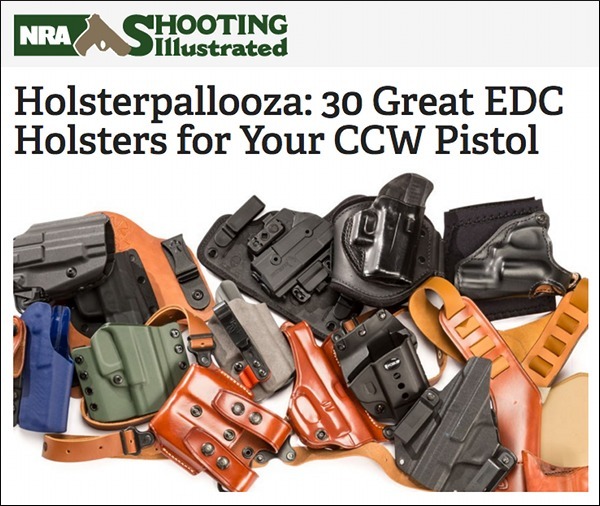 Share the post "Bargain Finder 160: AccurateShooter’s Deals of the Week"
Do you have a concealed carry permit, or do you plan to carry a concealed handgun in the future? 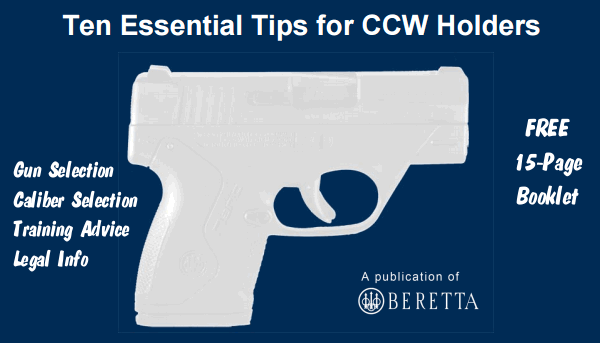 Then you can benefit from Beretta’s FREE 15-page e-book, Ten Essential Tips for CCW Holders. 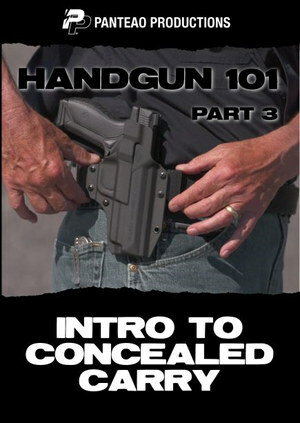 This eBook, in handy PDF format, helps gun owners select an appropriate handgun (and holster), understand legal obligations and responsibilities, and train effectively with the firearm. 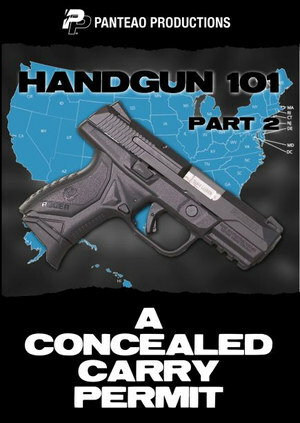 This short eBook offers many useful tips to consider, in particular for gun owners who are contemplating the pros and cons of everyday carry for themselves. 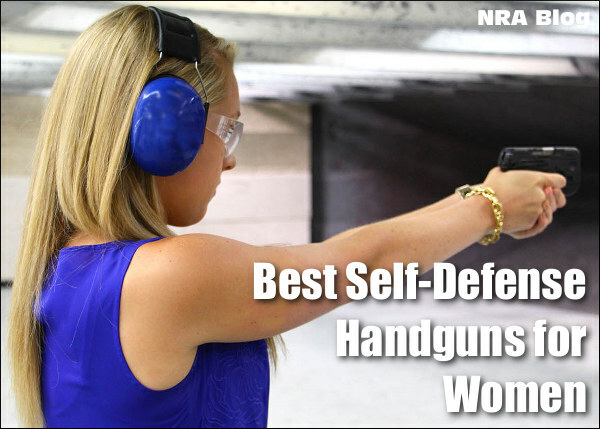 You may be surprised to learn when and how handguns are actually used for self-defense. Most defensive uses are at very short range and the incident only lasts a matter of seconds. 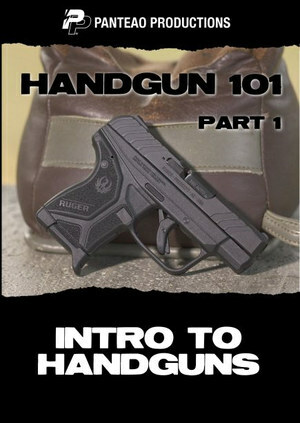 You need to be prepared, and train to be proficient drawing and aiming your weapon. 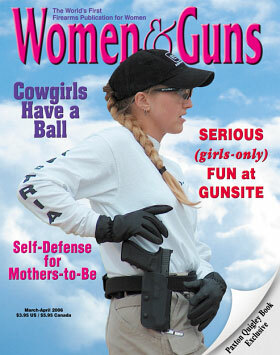 And remember, shooting is a last resort, when a safe retreat is not available. 55% of gunfights take place in 0-5 feet. 20% of gunfights take place in 5-10 feet. 20% of gunfights take place in 10-21 feet. The average man can cover 21 feet of ground in 1.5 seconds. 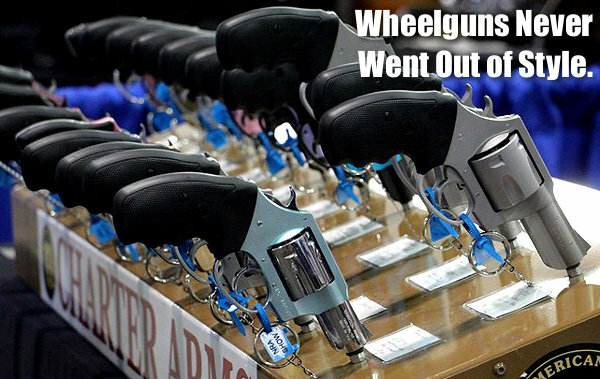 The average gunfight is over in 3-5 seconds. 3 to 4 shots are usually fired. Most gunfights take place in low-light conditions. On average, one shot in four strikes someone. 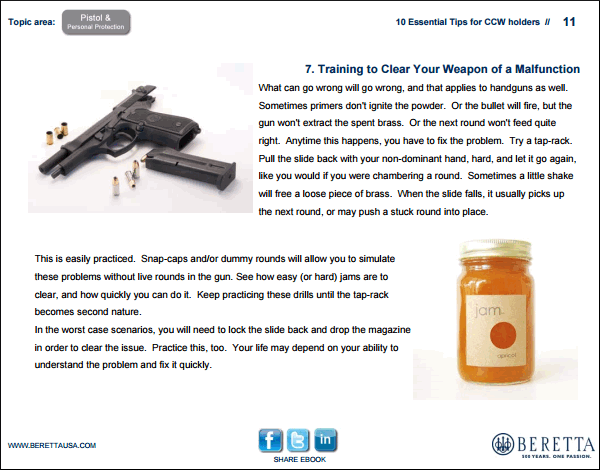 Here are two (2) sample pages from Beretta’s CCW eBook. 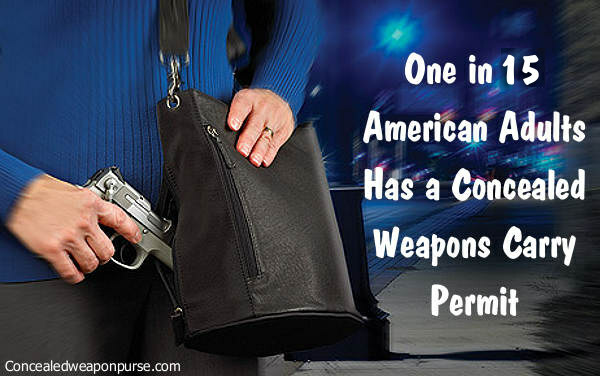 Share the post "Do You Carry a Handgun? Smart Advice for CCW Holders"
SFC Daniel Horner, now a civilian, is the best multi-gun competitor this Editor has ever met and seen in action. 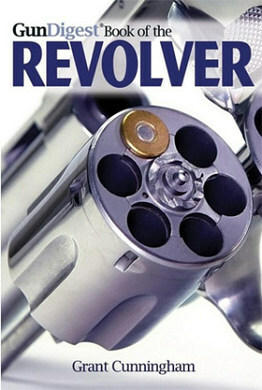 Horner is masterful with pistols, ultra-fast and accurate with rifles, and amazing with shotguns. Horner’s multi-gun aiming and transition speeds defy belief. Even with his world-beating skills, Horner is also respectful and humble. As a leading member of the U.S. Army Marksmanship (USAMU) team, Horner was never a show-boat, he was just (nearly always) the fastest guy on the range. I’ve seen him beat other top-level shooters by 10 seconds or more in a single stage. He’s that good. And now he’s turned PRO, having joined the SIG Sauer Shooting Team. Here are some of our favorite Daniel Horner competition videos. You can see why he won so many major championships, including all the top multi-gun competitions. In this USAMU Video, SFC Daniel Horner talks about grip, hold, stance, and body position. The proper hold/stance speeds up target transitions and keeps the muzzle on target for faster follow-up shots. Champion 3-Gun Ace Daniel Horner has joined the SIG Sauer Professional Shooting Team — Team SIG. Horner recently left the service of the U.S. Army where he rose to the rank of Sergeant First Class (SFC). 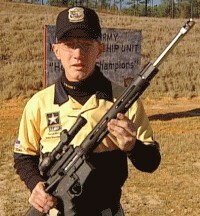 Horner served with the U.S. Army Marksmanship Unit, becoming one of the most successful shooters in team history. Horner also helped coach the USAMU Action Shooting Team. Horner will compete primarily in multi-gun matches, and long-range rifle competition as a member of Team SIG. Horner’s first competition with Team SIG will be the SIG Sauer Fort Benning Multi-Gun Challenge next month (November 15-18, 2018). Horner will campaign a P320 X-Five full-size pistol, and a SIG M400 SDI Comp rifle with a TANGO6 1-6x24mm second focal plane scope. 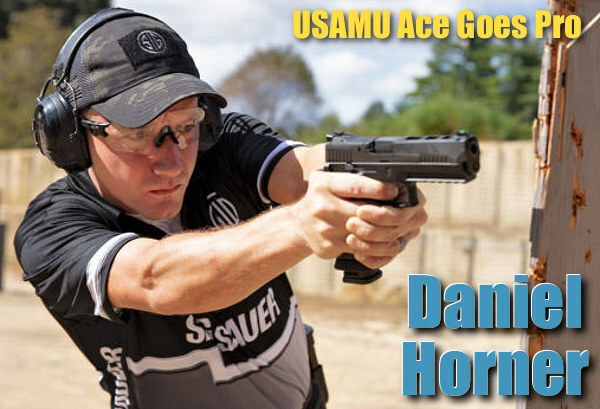 Share the post "Daniel Horner Goes Pro — Leaving USAMU for Team SIG Sauer"
Are you planning to purchase or sell a gun? Or perhaps you want to give one to a family member. Maybe you want to transfer a gun to a friend out of state. These are all situations that demand you understand the law before you buy, sell, or transfer a gun. Thankfully the NRA Blog has a series of helpful articles that can guide you through firearms transfers and transactions. Do note that laws on private transfers vary from state to state. Here are five articles providing key facts you need to know. Click each title to read the specific article. 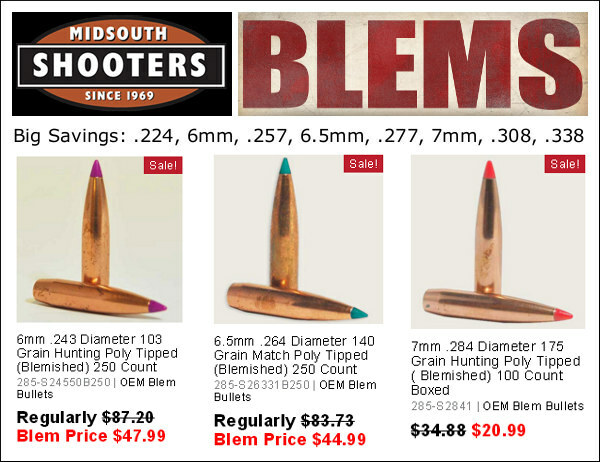 Share the post "Transferring Firearms — What You Need to Know"
Midsouth is now offering big savings on major-brand blem bullets. These are overruns, cosmetically blemished jackets or tip discolorations, or factory second bullets from a major bullet manufacturer (Midsouth isn’t allowed to name the company). 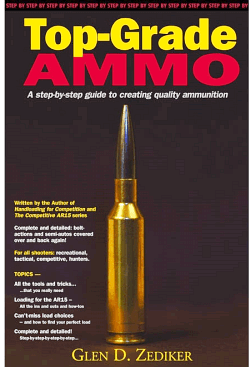 NOTE: Some projectile tips are misshapen, other packages may contain bullets which vary by grain weight. 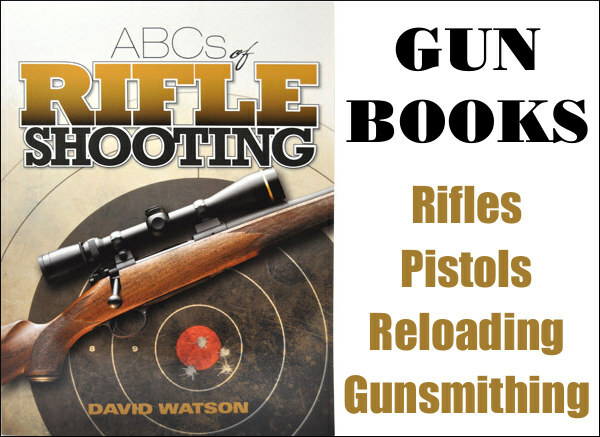 No matter what, you’re getting tipped hunting, or tipped match bulk bullets at huge savings. 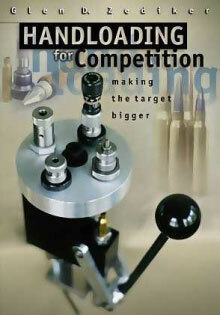 Many options in .243 (6mm), .257, .264 (6.5mm), .277, .284 (7mm), .308, and .338 calibers. Thompson Center’s new T/CR22 rimfire can use most Ruger 10/22 accessories including 10/22 mags. But it has some distinct advantages over the Ruger. The stock is a quality MagPul composite design. The barrel is button-rifled with a threaded muzzle. The bolt holds open after the last shot. This gun comes complete with front and rear iron sights as well as a Picatinny rail on the action. NRA reviewers praised this gun saying: “Thompson Center has taken the aftermarket parts you’re going to pay extra for [on a Ruger 10/22] and made them standard on the T/CR22, saving you some cash[. ]” Right now the T/CR22 is on sale for $299.99 at Brownells with a $50 manufacturer REBATE, for a $249.99 cost after rebate. But it gets better — use CODE “N8Y” during checkout to save another $20 and get free shipping. 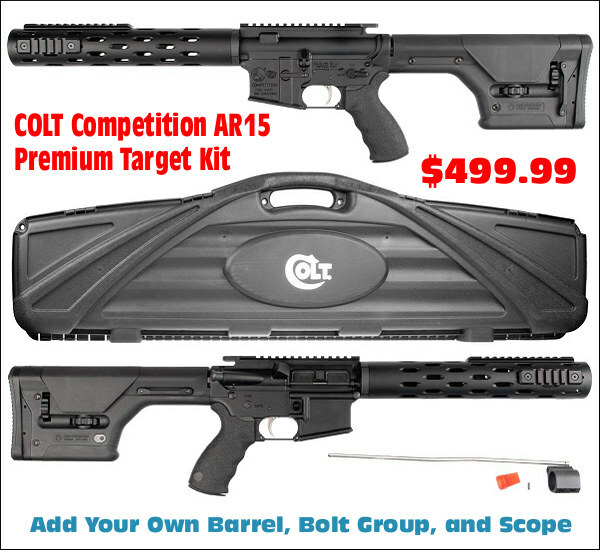 Then your actual cost for the rifle (after discount and rebate), is $229.99 plus $10.00 FFL Processing fee. 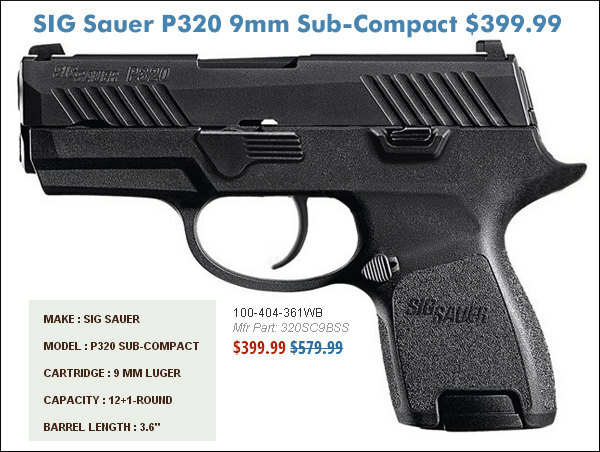 If you like SIG Sauer P-series pistols, you’ll love this GSG .22 LR rimfire. 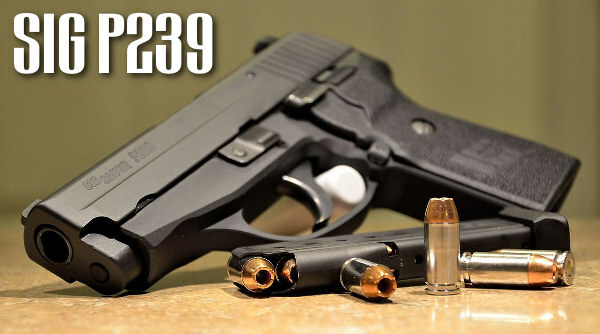 It faithfully copies the lines and ergonomics of the classic P226 9mm handgun. 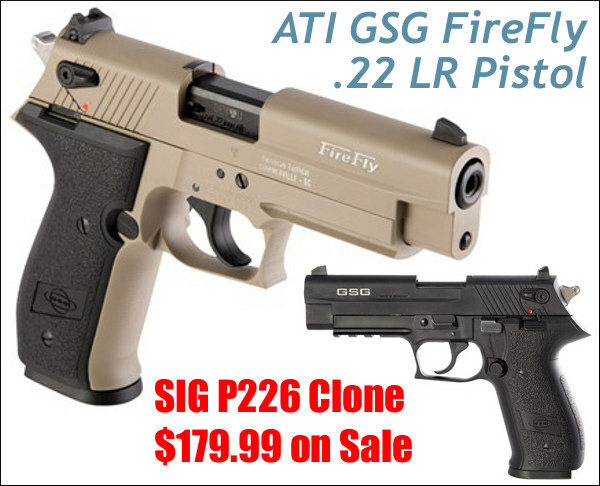 Make by GSG in Germany, the ATI Firefly features a 4″ barrel, alloy frame, and steel slide. 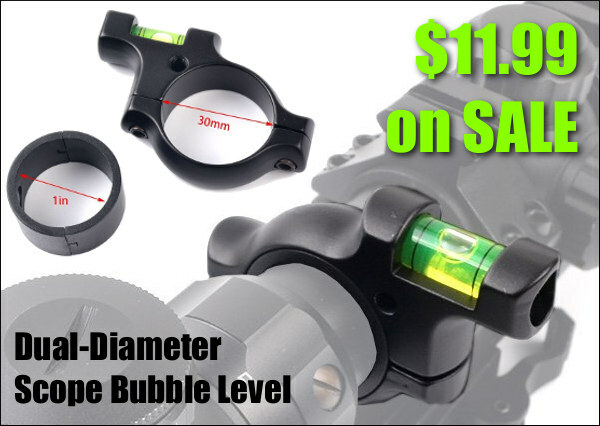 A simple blowback operating system provides reliable cycling with included 10-round magazine. The Firefly is on sale now at Brownells for just $179.99, marked down from $249.99. 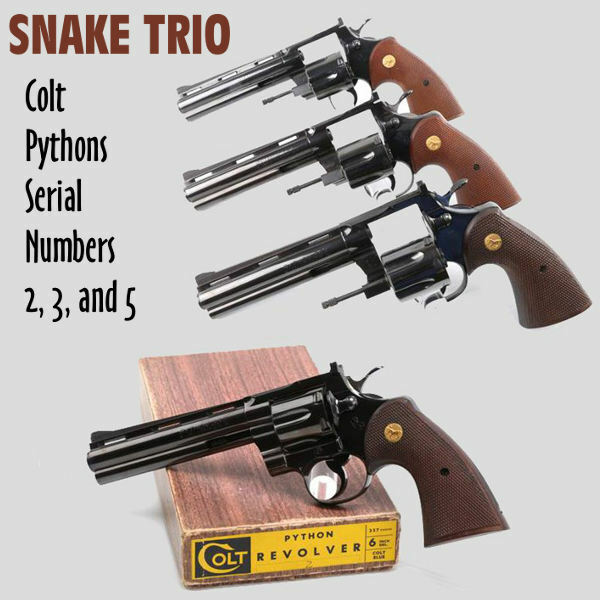 That’s a great price for a nice little rimfire that is offered in three finishes: Matte Black, Tan, and Dark Green. Weight: 1.53 pounds. The 2018 VihtaVuori Rebate Program is under way. 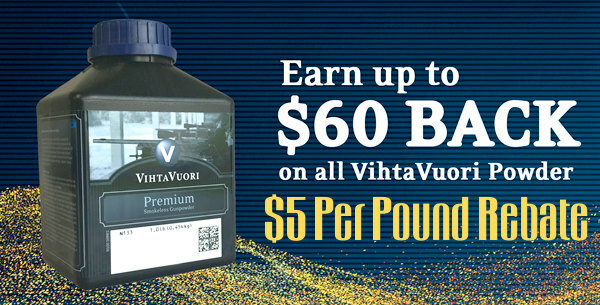 For a limited time, earn $5.00 back per bottle when you purchase VihtaVuori powders. Act soon as this offer expires on October 15, 2018. Be sure to keep your receipts and note the labels. The Rebate application MUST include proof of purchase showing retailer name and date of purchase. And the Rebate Form MUST include the serial number for each VihtaVuori bottle purchased. Natchez also has many Burris scopes up to 60% OFF. For example the Burris XTR II 1-5x24mm riflescope is marked down from $799.00 to $459.99, a $339 savings! Mossberg just announced a major fall season sale. 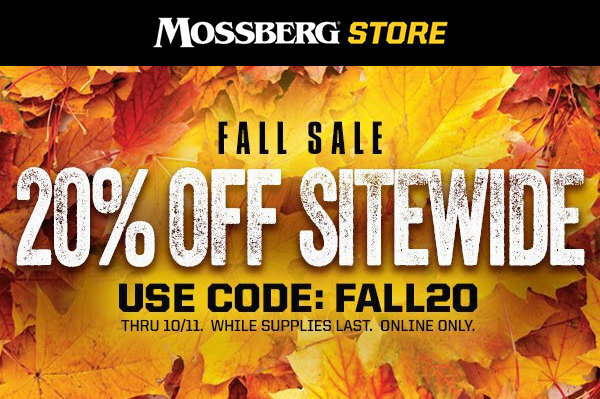 Virtually everything in Mossberg’s online store is now 20% Off with CODE “FALL 20″. 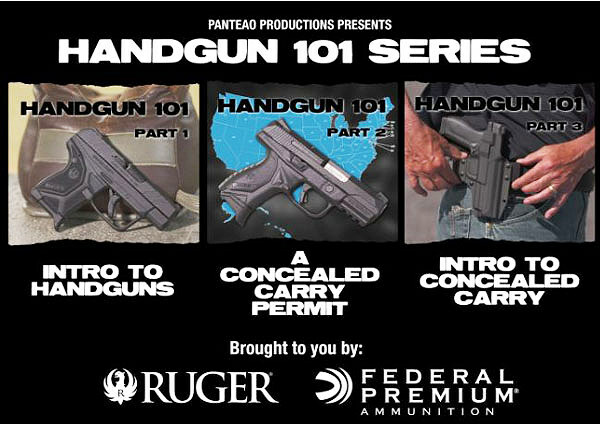 This includes stocks, barrels, triggers, sights, heat shields, magazines, apparel, range bags, gun cases, and much more. This is a great way to acquire quality accessories at bargain prices. This promotion runs through 10/11/2018. 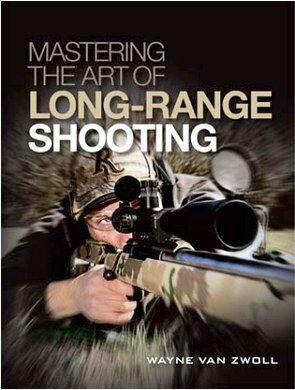 Mossberg Sale tip from EdLongrange. 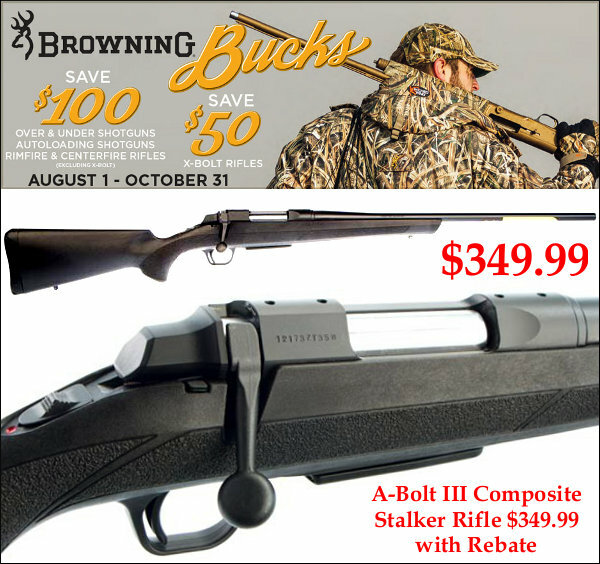 NOTE: This sale does not apply to complete Mossberg rifles or shotguns. Those must be purchased through retail FFL dealers. 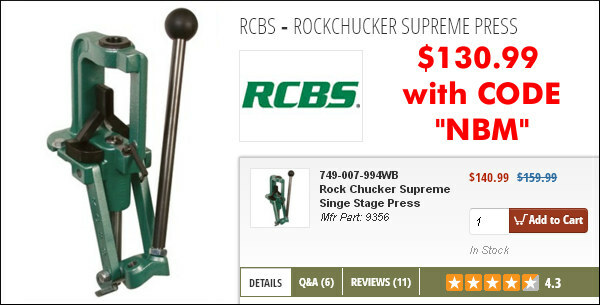 The RCBS Rock Chucker Supreme Press is a classic single-stage press that will handle all hand-loading sizing and seating chores. There’s plenty of leverage to full-length size big cases. The rigidity of this cast-iron press also allows precise, repeatable bullet seating. While we prefer to prime as a separate operation, you CAN prime your cases with the Rock Chucker. 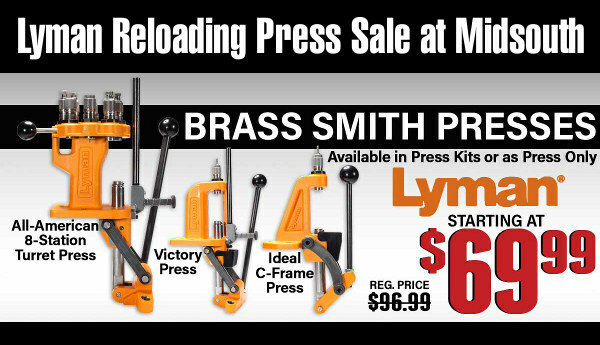 Right now this press is on sale at Brownells for $140.99. However, with CODE “NBM” you save $10 and get FREE Shipping. That way your net cost is $130.99 delivered. This same press sells elsewhere for up to $165.00. Share the post "Bargain Finder 159: AccurateShooter’s Deals of the Week"
For more information, visit www.initiative1639.org. Once again a serious threat to citizens’ Second Amendment rights is coming from the Left Coast. If you live in Washington State, you need to educate yourself on Initiative 1639 (I-1639), a THIRTY-page gun control measure on the November ballot. This is one of the most restrictive and radical gun measures ever put on a State ballot. Your vote is needed to block I-1639 from becoming law. This measure basically defines virtually ALL self-loading long guns as “assault rifles”. 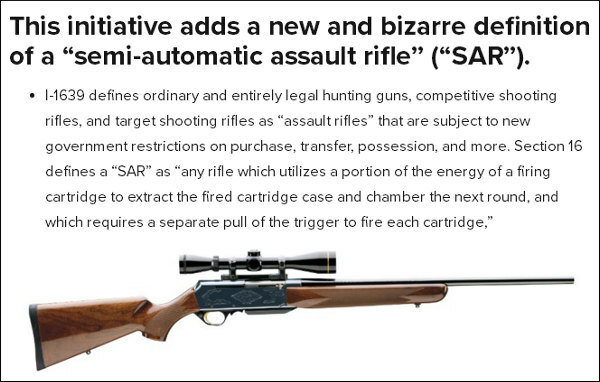 This would even include popular .22 LR rimfire rifles such as the Ruger 10/22, Marlin 60, and Remington 597. In addition, I-1639 imposes draconian gun storage requirements, imposes new taxes on gun ownership, creates a far-reaching gun registry, and mandates annual “verification” of gun owners. LEARN MORE HERE*. 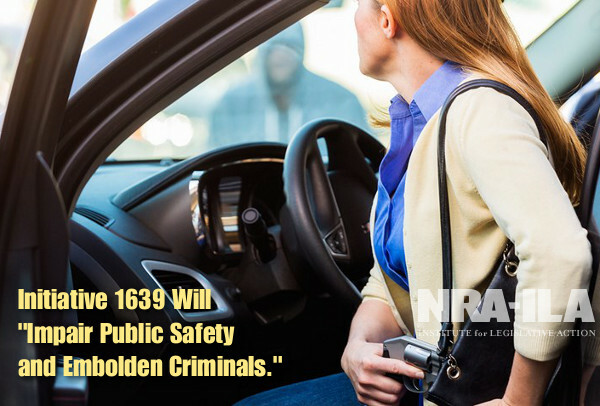 “Law enforcement professionals recognize the extreme nature of I-1639,” said Alan Gottlieb, chairman of the Citizens Committee for the Right to Keep and Bear Arms. “Not only does the initiative discriminate against gun owners, it classifies common recreational firearms as ‘semiautomatic assault rifles’ and requires gun buyers to surrender their medical privacy in order to exercise a constitutionally-protected right.” I-1639 is being pushed by the Seattle-based Alliance for Gun Responsibility, an extreme anti-gun advocacy group funded by billionaire dollars. Not just organized gun rights groups are opposing I-1639. In fact many Washington State law enforcement organizations have opposed this far-reaching anti-gun measure. 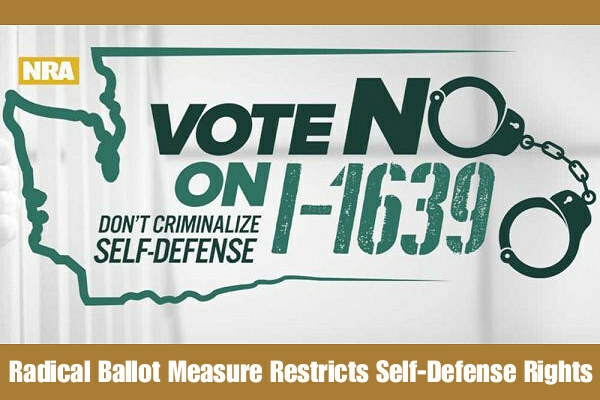 The Washington State Sheriffs Association (WSSA), Washington Council of Police & Sheriffs (WACOPS) and Washington State Law Enforcement Firearms Instructors Association (WSLEFIA) all oppose I-1639. 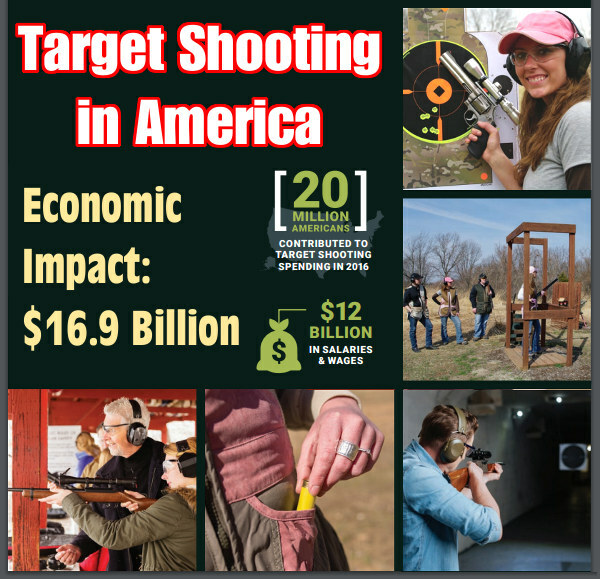 Photo Courtesy NRA-ILA which opposes I-1639. See Initiative1639.org. Share the post "Washington Gun Rights Threatened by Radical Ballot Measure"
RICHMOND, Va. – The National Rifle Association (NRA) has cancelled the second annual NRA Carry Guard Expo, which was scheduled for Sept. 14-16, 2018 at the Greater Richmond Convention Center in Richmond, Virginia, due to the impending threat of severe weather associated with Hurricane Florence. The hurricane is now predicted to make landfall on the North Carolina coast late Thursday. 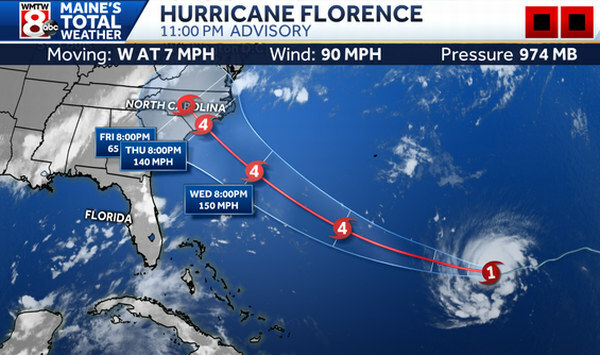 “The cancellation was made in the interest of public safety due to the forecasted arrival of Category 4 Hurricane Florence in the mid-Atlantic region this forthcoming weekend, and the resulting declaration of a State of Emergency by the Governor of Virginia. This decision required careful deliberation and concern for the safety of attendees, exhibitors and others involved with the event. 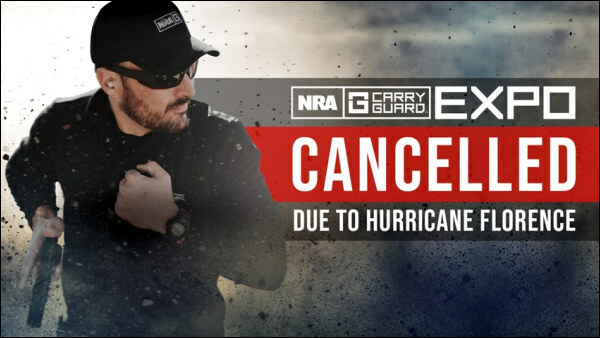 Share the post "NRA Carry-Guard Expo Cancelled Due to Hurricane Florence"